The morphologies of both the surface and subsurface of Arctic soils are shaped by cryogenic processes (Figs. 1.1 and 1.2). The soil surface is associated with various types of patterned ground caused by frost heave and sorting, while the subsurface is dominated by cryoturbation that results in irregular or broken soil horizons, involutions, organic intrusions, and organic matter accumulation, usually along the top of the permafrost table. Oriented rock fragments (Fig. 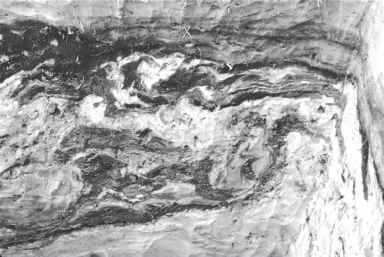 1.1), silt-enriched layers and silt caps are also common (Bockheim and Tarnocai 1998). The freeze-thaw process produces granular, platy and blocky structures (Table 1.3). The subsurface soil horizons often have massive structures and are associated with higher bulk densities, especially in fine-textured soils. This massive structure results from cryostatic desiccation (cryodesiccation), which develops when the two freezing fronts (one from the surface, the other from the permafrost) merge during freeze-back. 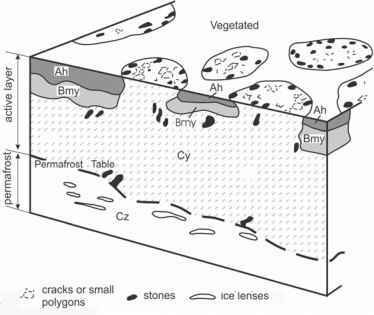 Although these macromorphological properties occur primarily in the active layer, they also can be found in the near-surface permafrost because of the dynamic nature of the permafrost (Bockheim and Tarnocai 1998). Arctic soils generally have high moisture content, especially near the permafrost table, which acts as a moisture barrier. As a result, gleying associated with grayish colours and redoximorphic features is a common occurrence, especially in loamy and fine-textured soils. Thin eluvial or leached layers resulting from the brunification process occur primarily in sandy soils in the southern part of the Arctic. Salt crusts on the soil surface are also characteristic. These salt crusts develop during dry periods in the summer because of higher evapotranspiration from the soil surface. 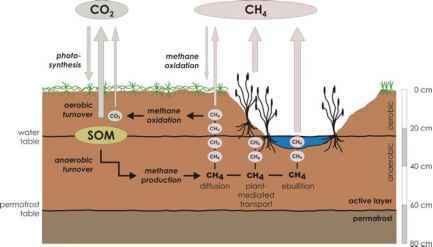 Thixotropy, which results in an unstable soil surface, is frequently present in the thawed portion of permafrost-affected soils, and is often associated with soils having high silt content. When a thixotropic soil dries out, a characteristic vesicular structure develops.